GRAFFITI MECCA “5POINTZ” MAY BE TAGGED OUT? In a head-on clash between powerful commercial real estate interests and graffiti artists under VARA, the real estate interests have scored a major victory…..maybe. We’ve posted previously about the fight to save 5Pointz which is self-styled as the world’s greatest “Graffiti Mecca” (See “U Can’t Touch This” http://wasserruss.com/art-law/u-cant-touch-this; ) Artists from all over the world have tagged the former factory complex in Long Island City and, as a result, the site has become renowned for its colorful representation of gritty urban life. The site has enthralled many millions of New York City subway commuters passing by on the neighboring #7 elevated line. The site has appeared as background in music videos, movies, television shows and more. However, the property owner now wants to demolish the site in a $400mm plan to build 1,000 apartments. The artists fought back and convinced Federal Judge Frederick Block to issue a temporary stay of the demolition under the Visual Artists Rights Act of 1990 (“VARA.”) Under certain conditions VARA allows artists to protect their works from being destroyed, and the graffiti artists claim that the demolition of 5Pointz will destroy their works in violation of VARA. Since VARA’s enactment there have only been a few head-to-head confrontations between real property interests and visual artists. That’s why this case has real significance. A hearing occurred before Judge Block last week and, on Friday, November 8, 2013, Judge Block announced that he was lifting his stay so that the demolition can proceed. Judge Block has promised that a written opinion will soon issue. The property owner has announced that they intend for demolition to commence before year’s end. According to reports, at the conclusion of the hearing Judge Block threw what could be a tainted bone to the artists. He offered to impose a stay on demolition if the artists filed an application before New York City’s Landmark Preservation Commission to preserve 5Pointz as a landmark. He apparently believes that there might be some potential protections for the artists under applicable landmark preservation laws. We believe Judge Block’s belief, even though well intentioned, is misplaced. Landmark preservation is intended as a means to protect against the destruction of historically significant structures. For sure, 5Pointz is artistically significant. However, one is hard-pressed to see 5Pointz as a site of historical consequence. VARA is the statute which exists to protect against artistic destruction, and if VARA can not preserve 5Pointz then it could be that no law may currently do so. 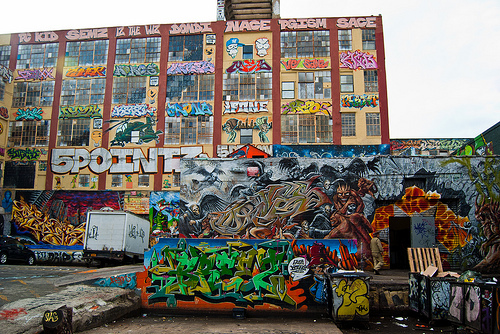 In fact, after the hearing concluded it was disclosed that the Landmark Preservation Commission had previously rejected an application by the 5Pointz artists because many of the threatened works were less than 30 years old, the minimum threshold for landmark review in New York City. Nonetheless, at the time of this posting the word is out that the artists are submitting a second landmark application, with over 1,300 “Requests For Evaluation” (that is, landmark endorsements by individual members of the public) as well as taking other measures while they lick their wounds from last week.